I have a little selection of monster/witch/Halloween-themed Cybils nominations for this Halloween day! 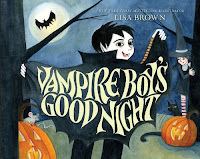 First, there's Lisa Brown's Vampire Boy's Good Night. The premise of the story is familiar - a vampire and witch child enter the human world and attend a Halloween party, where everyone thinks they're costumed as what they really are. The fun is in the many gruesome details, from the titles of the books in vampire Bela's tower to the bandaid on the butler's neck. The illustrations are beautifully designed and executed. This is a good choice to add to your Halloween collections or for a scary storytime for older preschoolers or kindergarteners. You could use it with smaller children, who won't pick up on the scary details, but they probably won't understand what a vampire is and older children might find the tone of the book a little childish. Next, we have the latest installment in the Splat series, Scaredy-Cat, Splat! by Rob Scotton. Splat is excited about the school Halloween party and desperately wants to be the scariest cat of all. 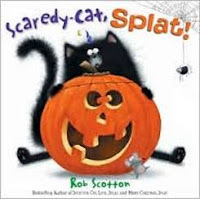 But Splat just isn't scary...or is he? This is a cute series with lots of popular appeal. The cartoon illustrations and bulging eyes of the characters are very humorous and Splat's stories convey a lot of familiar childhood fears and worries in a sympathetic way. A good choice for your holiday shelves and Halloween storytimes. 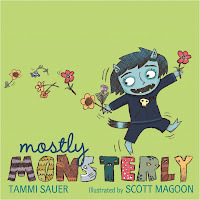 Tammi Sauer's Mostly Monsterly, illustrated by Scott Magoon, is a delightful twist on two familiar monster tropes - the unexpectedly nice monster and the monster who is too nice to fit in with other monsters. Bernadette is "mostly monsterly" on the outside, but on the inside, she's....just too nice. Can Bernadette be monsterly enough to fit in? Her gruesome solution is ickily perfect, combining her own sweet side and the monsterness her class demands. The clean illustrations have a delicious blend of gross and pretty, with lots of little funny jokes and a sympathetic depiction of Bernadette herself. 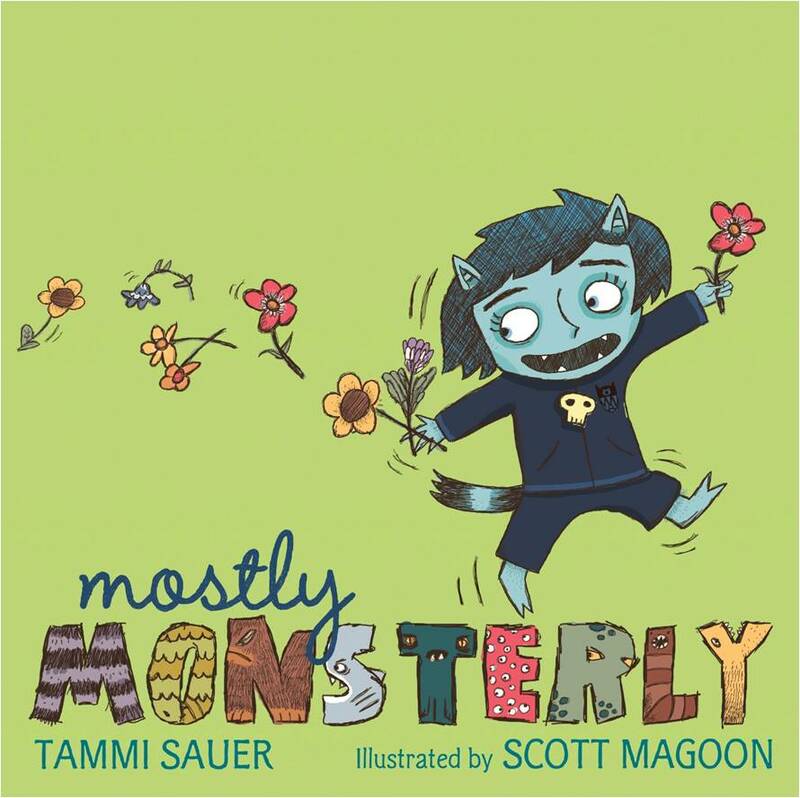 This is a more general monster book and I'd recommend it for your general picturebook collection, not the holiday section. 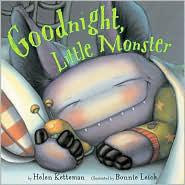 In Helen Ketterman's Goodnight, Little Monster, illustrated by Bonnie Leick, a large, furry monster baby gets ready for bed. His familiar night-time rituals include picking bugs out of his ears, finding his stuffed slug, and getting his hair tangled. The conceit doesn't really hold up, since the monster has a very thorough bath, which doesn't match getting his hair tangled. One would also expect the monster to be afraid of the light not the dark. The rhyming text and lots of sentimental mommy-and-monster interaction feels like it's aimed at a very young crowd, but the emphasis on eating bugs (lots and lots of dead beetles) and the gruesome details of the illustrations (the monster's night light is an eyeball) would be more appropriate for older children. If you have very small children who want "really scary stories" this might be a good selection. There are plenty of monster bedtime books though, from Where's My Mummy by Carolyn Crimi to I need my monster by Amanda Noll. This is an additional purchase for library collections. 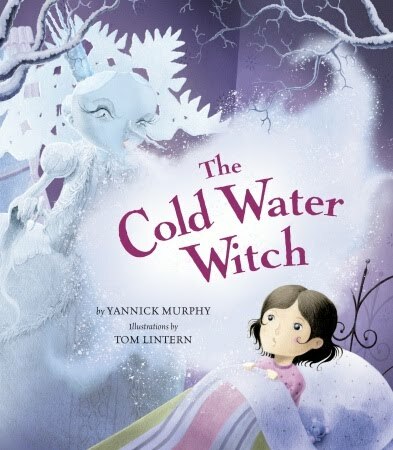 The Cold Water Witch by Yannick Murphy, illustrated by Tom Lintern isn't really Halloween fare, but it has a fairly creepy witch, so it's going in this stack. An evil and yet rather enchanting icy queen attempts to lure a little girl into coming with her to her frozen kingdom. In a series of clever tricks, the little girl outsmarts the witch and finally melts her completely, revealing the lonely little girl trapped inside. There are some strong passages in the story; some of the language describing the cold lands is lovely and the little girl has some brisk and funny dialogue. 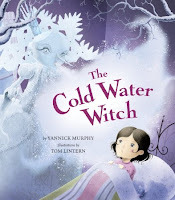 The plot is weak though - the cold water witch's sudden melting doesn't make sense, since earlier in the story the little girl was trapped when she touched the witch, then the second time the witch is melted. The fairy tale elements such as pushing the witch into the refrigerator instead of the oven, are clever but there are too many different parts to the story that don't fit well together. The illustrations fit the storyline well - Lintern's pencil and Photoshop technique creates lacy art that's perfect for the icy landscapes and characters, as well as giving the little girl a simultaneously realistic and fanciful air. An additional purchase if you need more quasi-fairy tale stories. 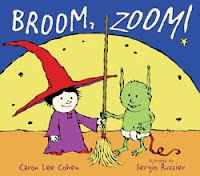 Broom, Zoom! by Caron Lee Cohen, illustrated by Sergio Ruzzier. I think the main appeal of this very simple story, at least in most of the reviews I've looked at, is Sergio Ruzzier's art. Since I don't find his art attractive (heh, that sounds like I'm trying to date it) this book didn't really work for me. There's only a few lines of text, varying on "I want it" and "I need it" as a little witch and a monster fight over a broom. Their fight is resolved when they share the broom to clean up a mess and then fly off towards the moon. This simple story would probably work well with toddlers. 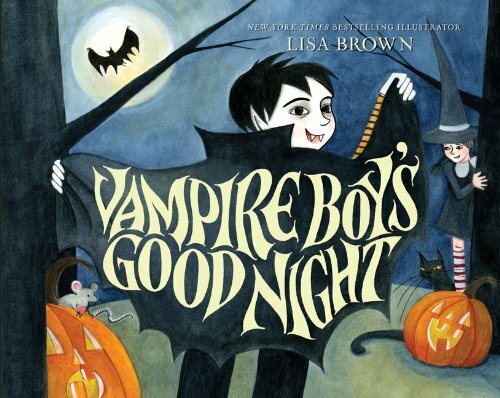 A good choice if you need additional Halloween books or titles suitable for young listeners. Last title! AlphaOops! 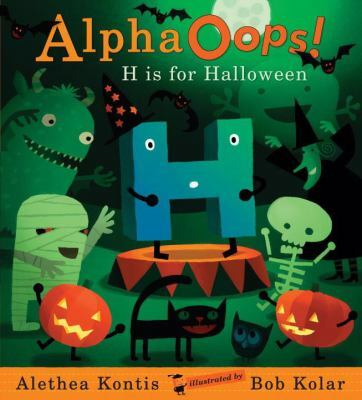 H is for Halloween by Alethea Kontis, illustrated by Bob Kolar is the sequel to the first AlphaOops! 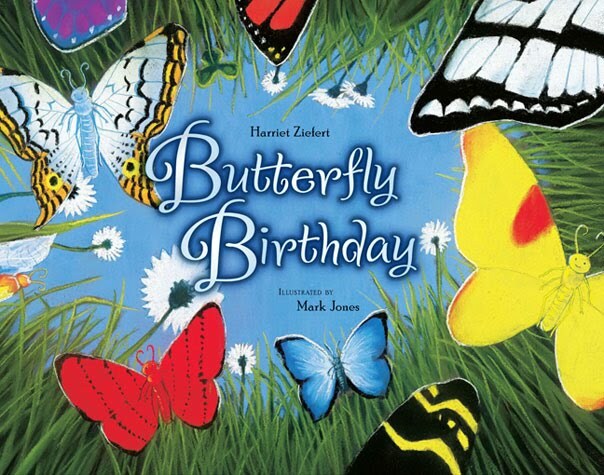 book, The Day Z Went First. In this story, the alphabet letters are once again putting on a production, and each letter has a scary Halloween thing they're representing - except poor letter B. Lots of little jokes, emphasis on various sounds and letters, and attractive digital illustrations make this book a sound choice for your core Halloween collection at the library. Weird but in a fascinating, sweet kind of way. That pretty much sums up my feelings about this book. Storytime audiences feel a little differently about it; parents are a bit doubtful about it, younger kids are intrigued, and older children feel a need to explain the oddities. There are three stories here, each featuring the same characters and general plot. Mr. or Mrs. Goat get the bunnies in trouble. They go to Bear for help and he fixes the problem. "Everyone is happy." Simple, right? 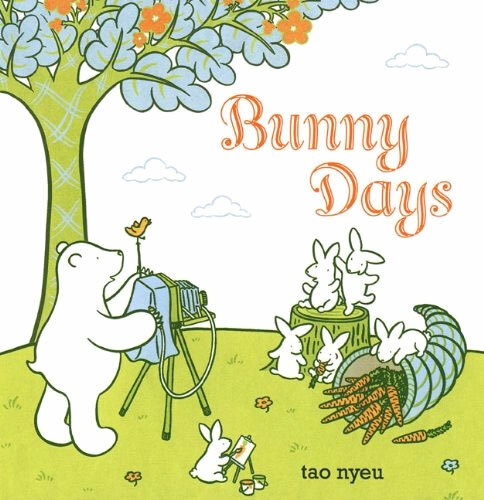 But there's so many delicate details sprinkled throughout the story...In the first story, the bunnies get dirty and need a bath and the illustrations are predominantly blue. In the second story, the bunnies get sucked into Mrs. Goat's vacuum cleaner and the illustrations are browns and oranges. In the third story, Mr. Goat accidentally cuts off the bunnies' tails when he's trimming the hedges and the story is all greens. Bear's solutions in each story are completely logical from a young child's point of view, while an older child will relish the delicious silliness of putting the bunnies in a washing machine and hanging them out to dry. 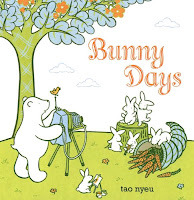 Nervous parents will look a little askance at these stories - I've had several giggle uncomfortably or delicately hint that the stories were a little...you know...especially the bunnies getting their tails cut off. But it only seems to bother adults. Very small children giggle uncontrollably throughout while older children explain matter-of-factly to their younger siblings and friends "they're not real bunnies! It's pretend." Exactly. Delightful, silly, logical pretend. Verdict: Take a look at it yourself to see if it will work in your library. Not everyone will appreciate the dry humor and fairy tale logic of the stories, but if you think you have a good audience, it's a lovely book. How have I not reviewed this yet?! I've read it at school visits, storytimes, more school visits, and it's circulated so heavily since we got it last May that I've already had to tape the pages a couple times. The premise of the story is simple: You have a shark. You have a train. You have a series of increasingly insane situations. Who wins? Well, it all depends...if they're underwater, falling through the air, eating pies, having a burping contest, choosing board games, bowling....you get the idea. The story is framed spreads of two small boys playing with their toy train and shark. Older kids will quickly realize of course, that it's all in the boys' imagination. But who cares if you know it's real or not? It's FUN! 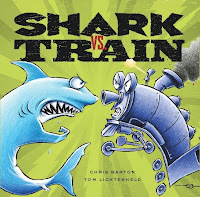 A marvelous interactive book for storytime - some of the situations are obvious, some are a little tricky, so be prepared to mediate between Team Shark and Team Train when there's a reasonable doubt. If you have a smaller, older group of kids, they'll enjoy reading the speech bubbles. With a younger, bigger audience it's better to stick to the basic text and focus on the kids' interaction, as you discuss the various advantages. Lichtenheld's art is stunningly hilarious, peppered with small jokes and effortlessly conveying the craziness of the situations with a bulging eye or wildly waving train wheels. The story and art blend seamlessly together to create a truly humorous story, perfectly in tune with the way real kids play, and enjoyable for the whole family. Verdict: A must have for your libary. Read it at storytimes, on school visits, and to random children walking through the library. 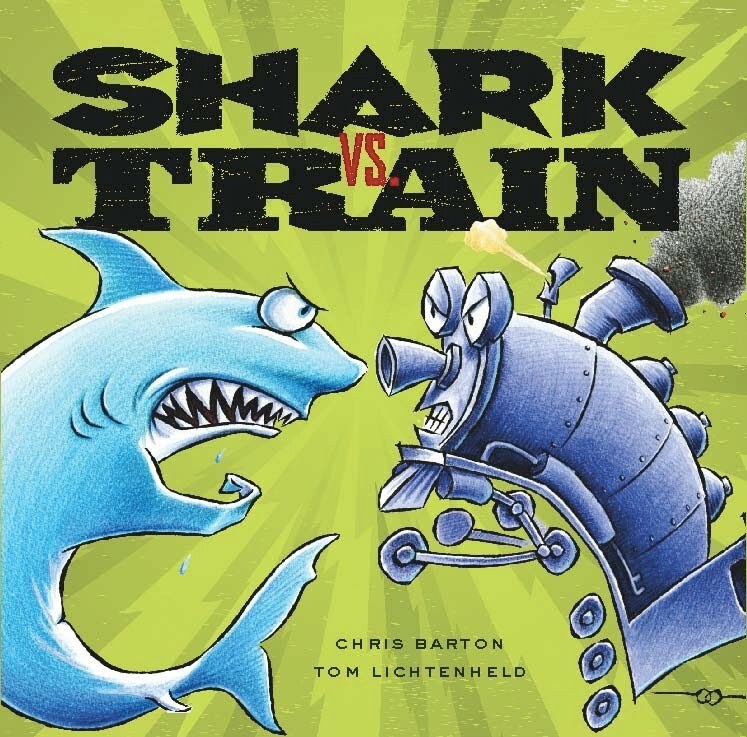 Create your own shark vs. train scenarios (Teddy Bear vs. Squirrel! Clouds vs. Airplanes! Zombies vs. Unicorns! You get the idea) or have a Shark vs. Train party with shark and train hats and various challenges for the teams. As long as we're doing chicken stories...most of us know the story of foolish Chicken Little...but what about Chicken Big? When a truly enormous, gigantic, HUMONGOUS chick pops out of his massive shell, there's widespread panic among the chickens. He's too big to be a chick - so what IS he? An elephant? An umbrella? A hippopotamus? 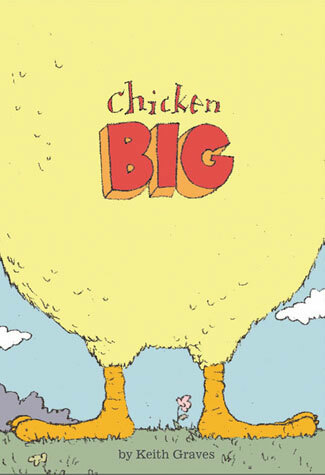 As Chicken Big helps out the foolish chickens, their guesses get wilder and wilder until finally they realize the truth and Chicken Big finds his place in the world. The outrageous humor, silly chickens, and panel-style illustrations will make this a fun favorite for both storytimes and individual enjoyment. Verdict: Recommended. Pair this with Chicken Little for storytime, so you make sure your audience gets all the jokes, and hand it to kids up to 1st or 2nd grade who will appreciate the raucous humor and jokes on the original story. This is the first book in Enchanted Lion's new series, Stories Without Words. 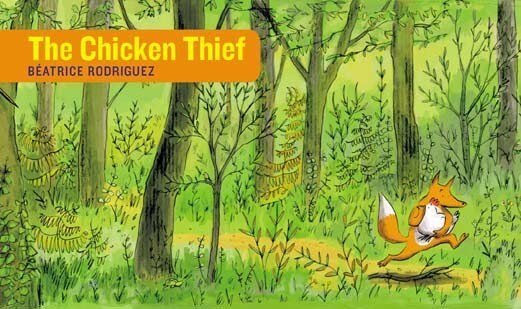 In a series of wordless panels, Rodriguez tells the story of a happy family; bear, rabbit, rooster, chickens and chicks and the shocking kidnapping of one of the chickens. The bear, rabbit and rooster pursue their kidnapped friend and the dastardly fox through the forest, over mountains and across the sea until they finally rescue her...or do they? Once you've read the surprising ending, you'll have to go back and look at the story with new eyes, following the hidden clues and subtle plot changes to figure out what's really going on. The illustrations are light and amusing, with rounded comic lines and warm colors, perfectly suited to the simple surface story and the sneakier underlying plot. The nice rectangular shape of the book is particularly intriguing and perfect for a child's hands. Verdict: Wordless books can be a hard sell in the library, but the unique shape and friendly pictures of this one should make it a popular choice. 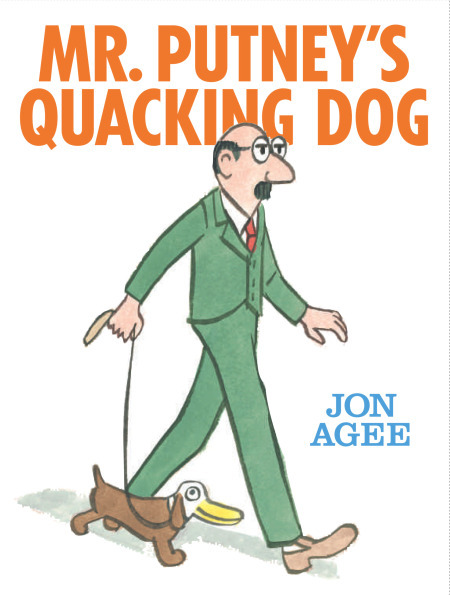 Also a great book to introduce children to the idea of following action and plot through comic panels. I'm looking forward to the next book in the series, a new offering from Arthur Geisert titled Ice. When I heard Mo Willems had a new series, it went on the order list automatically. I took a quick look when it came in...and was immediately charmed. A simple question and answer dialogue, with a strong rhythmic feel, marches through bold cartoon illustrations. With only a handful of words and lines, Willems creates a story that's full of child appeal, will tickle grownups' funnybones, and appeals to early readers. Quite a feat! 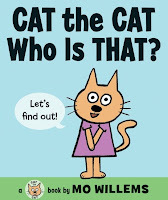 The main question about the Cat the Cat series is where to locate them in your library. They were nominated in the picturebook category for Cybils, and I've seen several libraries place them in that area. 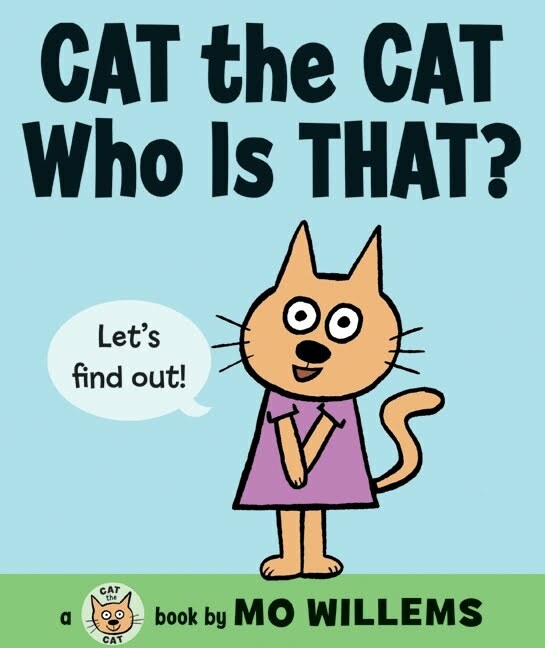 I've read them aloud in storytime; I purchased a second copy of Cat the Cat for my backup toddler storytime. It's a perfect toddler storytime read, short, interactive, with nice bold pictures a large group can see. 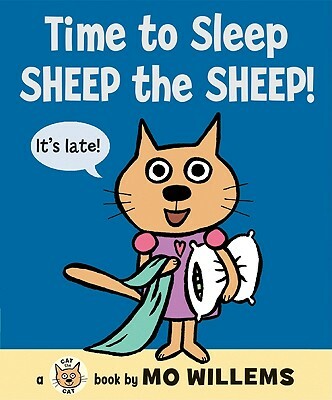 I've also read Time to Sleep Sheep the Sheep! aloud to a preschool audience and it takes this slightly older age to fully appreciate the humor at the end - and older kids think the repetitive names are hilarious. Giraffe the Giraffe anyone? Then again, these books are perfectly suited for beginning readers, or "pre-readers" if you want to think of it that way; kids who are just starting to put letters together into words. The bold type and repeated simple words are perfect for this group. Most of the publicity and reviews categorize these as beginning or easy readers as well. In my library, we ended up putting these into easy readers. They've been circulating briskly, but they're still on the new shelf so it will be a while until we know how they circulate when they're on the easy reader shelf. 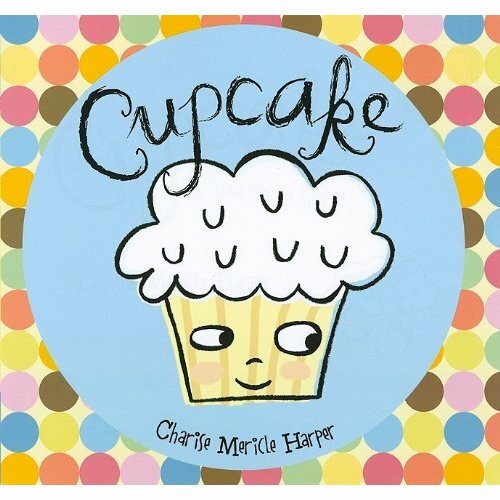 Verdict: A must for your easy reader or picture book area. Hey, why not buy two copies and put them in both places? I don't like Charise Mericle Harper. No, I am not in a grumpy mood, I'm just a woman of strong dislikes. I found her Fashion Kitty really annoying and generally consider her illustrations a poor imitation of Lauren Child. 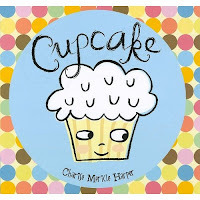 But I was reluctantly forced to adore this oddly charming story of a plain cupcake longing for decoration and finally achieving the perfect look with the help of a rather confused candle. Verdict: Light and fluffy, the perfect cupcake. This is a fresh and sweet take on the "be yourself" cliche. You don't have anything like this in your picture book collection - add it! This one I LIKE. 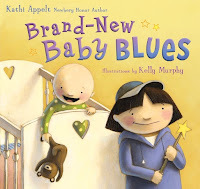 Strong, infectious rhymes, blocky, colorful pictures with lots of strong lines and humor;, this is going to be a storytime favorite for a long time. I'm glad I ordered it for the library. As the farmer feeds each animal, children learn what the horse, chickens, geese, pigs, and the dog love to eat. 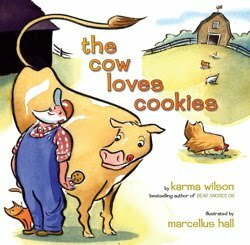 But, the cow has a special love and in a sweet and funny surprise ending, we find out she's not the only one! The building and repetition of the swinging rhymes crys out for music - someone get a tune for this so we can have a rousing chorus in storytime! Hall's illustrations show a rather old-fashioned family farm, but there's nothing wrong with that. His animals have strong curves and swooping necks and the background is filled with comfortable, familiar farm images and pleasant vistas. His Santa-ish farmer exuberantly moves from chore to chore, always followed by the long and clever tongued brown cow. The type and design are very readable and easy to follow along for beginning readers. I did think the final joke on the last page was a little unnecessary, but that's a minor quibble. This book probably won't ever win huge awards (and I'm not saying anything about the Cybils, etc. etc.) but it's the type of book that parents and children will delight in and remember long after their childhood is over. The kind of book that librarians 20 years from now will be getting regular stumpers for from young adults and parents eager to recapture a childhood memory or introduce their own children to a beloved book. Verdict: A must-have for your library and storytime collection. 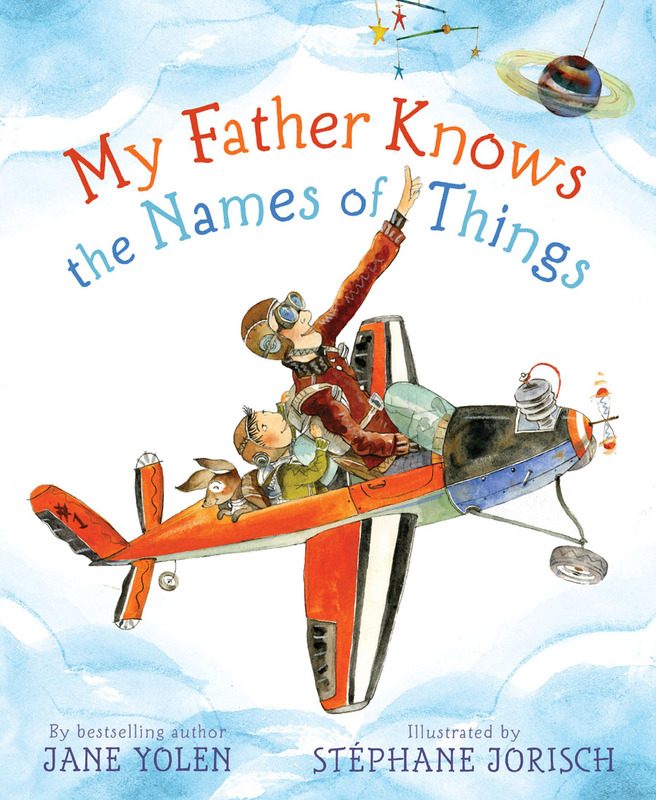 There aren't that many good dad picturebooks for older kids. Toddlers, yes there's quite a few of the "I love my daddy" variety (including Sebastien Braun's gorgeously tender books) but for older kids? Nope. Now, we have an excellent one. 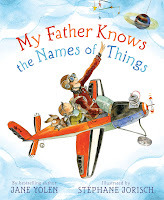 Jane Yolen's rhythmic text accompanies Jorisch's sparkling colors and energetic art to extol all the many things a child's dad knows, from the names of clouds to "which dinosaurs are meanest." Don't just pull this out on Father's Day, bring it out all year to enjoy. I'm looking forward to having the kids guess at the names of things in the illustrations....how many will they know? And how many can they make up? Verdict: Recommended for storytimes with preschool and kindergarteners and also for addition to your holiday books. And just for happies! I can't really explain the plot of this story, because there isn't one. It's a series of riddles - with hilarious answers. "Who wakes Mr. Putney up in the morning? An alarmadillo". Heh heh heh. I read this to my friend Sara-the-librarian and we both cracked up. 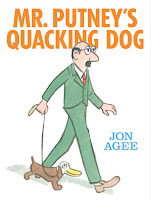 The wordplay is funny enough on its own, but matched with Jon Agee's straight-faced illustrations....laugh fest! Younger children probably aren't going to get this one, even though there's minimal text and the illustrations aren't too complex. The ones who are really going to crack up over this are the 1st and 2nd graders. Pair it with Mac Barnett's Guess Again! and be prepared for riotous laughter! Verdict: Recommended for school visits and casual dipping into with colleaugues during breaks. Teachers will also find the wordplay fun to use in class and maybe as a tongue twister game. Spork doesn't fit anywhere. 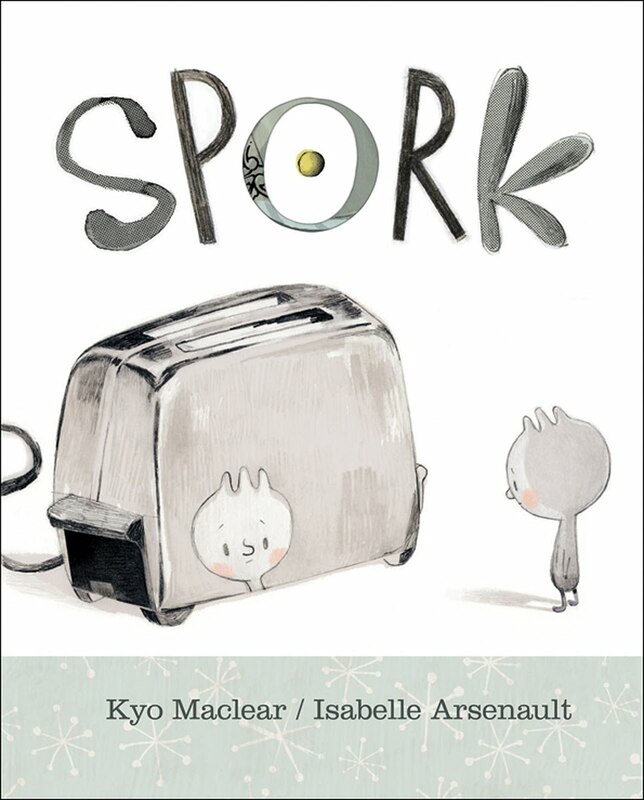 Most cutlery don't mix - and they're not interested in finding a place for Spork, even though his parents think he's special. Spork tries to fit in. He tries to be more round for the spoons, more pointy for the forks...but it doesn't work and he finds himself back in the lonely world of unmatching utensils. Until, suddenly, a new creature arrives and Spork discovers he can be useful after all and find a place at the table. I like this book for several reasons. It deals with sensitive issues in a thoughtful way, but isn't heavy-handed. It's funny and light and the illustrations are intriguing and amusing. I especially liked that the Spork didn't just decide he was special and having his parents think he was perfect was not enough - he found his place when he became useful and contributed. While this would be a good book to read with a biracial child who's dealing with bullying or emotional issues, it's also a fun book to read to kids anytime. Sporks are just inherently funny, you know? Verdict: Recommended for fun and educational purposes! I've read this with preschoolers - the text is a little lengthy for younger ones, but easily abridged and they got a big kick out of it. Older kids appreciate the subtle humor more though. ISBN: 9781553377368; Published September 2010 by Kids Can Press; Review copy provided by publisher through Raab Associates. Simple, colorful drawings expand a child's imagination in sequential form. Doesn't that make you want to read this book? No? How about this? An imaginative journey from the comforts of home, through hysterical silliness and back to the reassuring warmth of a child's house. 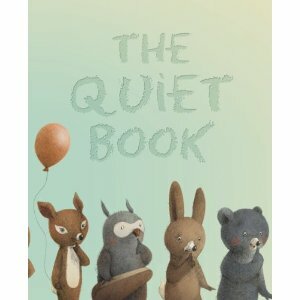 This is a simple but lovely little book. It's sized a little differently than most picturebooks, being about six inches square and has about twice as many pages as the average picturebook. But it's still a great read-aloud selection. Each page has one item - a house, a room, a princess, a dragon, a planet, etc. There are two lines of text; one naming the item, the second introducing the next page. So, you see "a book of fairy tales" and under the illustration of the book, the text reads "In the book of fairy tales..."
You'll have to turn the page to find out what's in there! Some of the items are easy to guess, like a forest around a hunter or a rocket ship in outer space. Others aren't so easy. What's under the bed? What's behind the pirate? What's behind the ducklings? We're very fond of guessing books in my library, especially during school visits (I had kids rolling on the floor and screaming when we debuted Mac Barnett's Guess Again!). I can see a wide variety of uses for this story, from a simple read-aloud to toddlers and preschoolers, interactive guessing game with 1st and 2nd graders, writing prompts for elementary-age children, or a game for long drives in the car! Verdict: Recommended for a wide variety of ages and uses. ISBN: 9781554536412; Published September 2010 by Kids Can Press; Review copy provided by the publisher through Raab Associates. A group of softly drawn little animals in shades of brown and gray illustrate different kinds of quiet, from scary and sad moments, to peaceful and happy experiences. This one just didn't grab me. I'm not generally up for "concept" books at the best of times and the limited colors and subdued mini stories in each picture didn't attract me. I can see where it's supposed to be humorous, but it didn't tickle my funny bone. 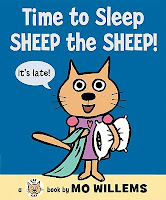 It might make a nice bedtime book or possibly a good interactive discussion book for storytime. One odd note - why didn't they put the author or illustrator on the cover? Very confusing. Verdict: Not recommended by me, but everyone else under the sun likes it. I'm not sure why. I'm more interested in seeing the upcoming Loud Book she's doing. Caterpillars and other bugs gather to celebrate the vernal equinox in an explosion of color and light. I love the vibrant, gorgeous colors and elaborate decorations and details of the bugs' celebrations. The art is definitely the high point of this book. I was disappointed by the text. It's too scattered and has no strong narrative thread. The odd juxtaposition of fact - how bugs hibernate for the winter, metamorphosis, and the vernal equinox - contrast oddly with the anthropomorphic bugs and their party. The addition of a "lesson" is also confusing; a small ant is upset that the caterpillars aren't helping with the party, but then learns that they are doing their own work, changing into butterflies. The story ends on an odd note with an unanswered question from the small ant. I tried reading this in storytime and although the kids liked looking at the pictures, they really, really didn't care for the story. Preschoolers are too young to understand the concept of the vernal equinox and don't understand metamorphosis as presented in the book. But I don't think the anthropomorphic bugs will appeal to older children. Verdict: Reluctantly not recommended for library purchase, because I really, really do love the artwork, but the text just doesn't work. I generally am not in favor of "arty" picturebooks. I would rather see picturebooks about kitties and doggies and penguins than about artistic expression and the creative urge. And in case you're seeing a trend, yes I do generally approach each new book I read with suspicion. I'm that kind of person. Anyhow, I will make an exception to my no-artsy-picturebooks rule for Tom Lichtenheld. 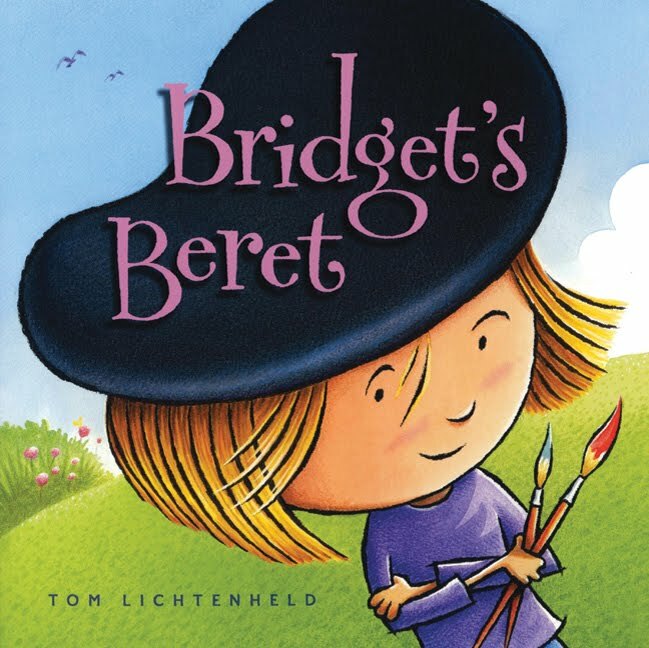 Bridget, proudly topped off by her genuine artist's beret, loves drawing. Her exuberant, colorful pictures dominate the warm greens and yellows as she paints and draws her way through the landscape....until her precious beret is lost. Will she ever discover the joy of art again? This colorful and funny picturebook is full of hints for getting the creative juices flowing, gentle nudges about artists' inspiration, and plenty of sly and silly humor. Verdict: Highly recommended! A great story to read before you do crafts or art projects in the library, or just for fun! A little girl sings the Brand-New Baby Blues, lamenting all the ways her life has gotten worse since she gained a baby brother. As she complains, she gradually realizes the baby is kind of cute and then decides that it might be fun to have a baby brother after all. 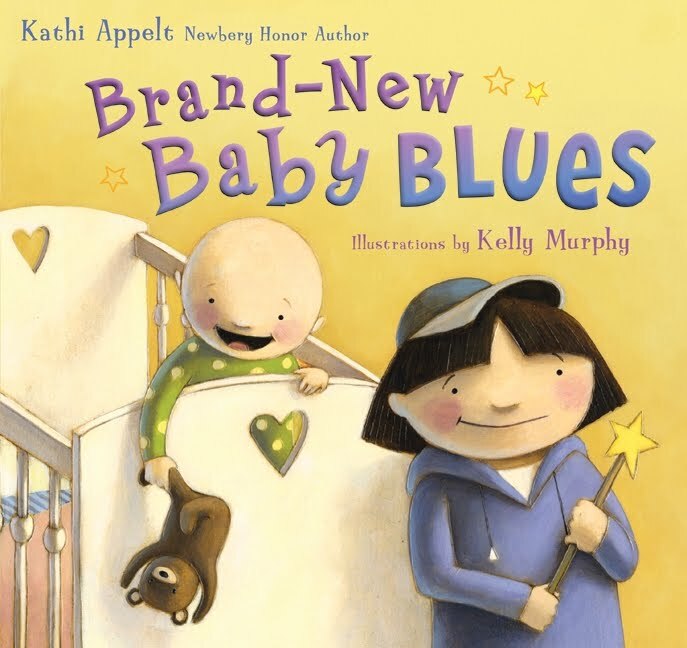 The number of new sibling books is legion and while this story is cute and sweet and the pictures are appealing, it just doesn't stand out. The girl's change in perspective is rather abrupt with no reason given except that she notices the baby is cute and her parents reassure her that she is special also. Verdict: Recommended if your library is in need of more new baby/sibling books. Isabel and her friend Walter desperately want a balloon at their class graduation. But the porcupines aren't allowed to have balloons - if they pop, someone might get scared or hurt! After many plans, Isabel finally comes up one that works! The bright, simple pictures were attractive, and Isabel's solution was humorous, but I kept doing double-takes. I can't imagine a school keeping one set of children out of part of their celebration for whatever reason. Even if they're porcupines. 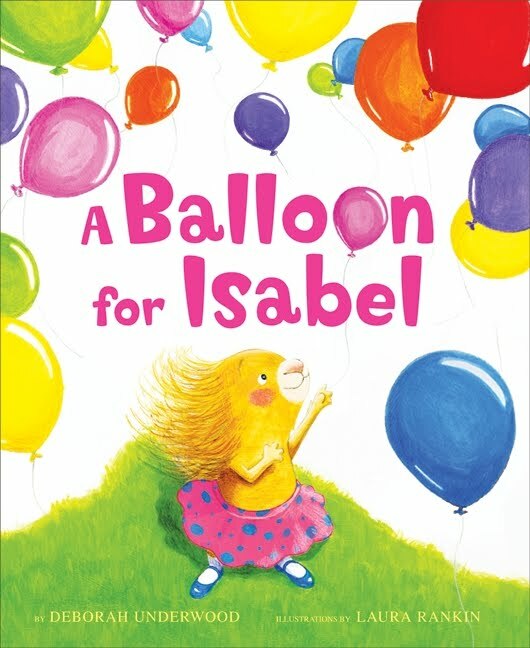 Isabel's solution was ingenious and her teacher's delight at finally getting her own balloon infectious, but I just can't believe the premise. Does this sound realistic to teachers out there? I have no real school experience, so I wouldn't know. Label me intrigued but doubtful. Verdict: Recommended if you need more school stories in your collection. 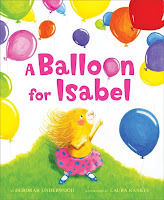 Kids will enjoy the descriptions of all the fun things you can do with balloons and Isabel's sugary solution. This has been one crazy week. So far, we've had three visits from the police, a total program attendance hovering near the 250 mark, a huge glitch in our inventory process, and I've been out for two days. Yes, I took two days of vacation to clean my apartment and put together my new four poster bed from Ikea. Hey, it's a big bed! In the midst of the craziness, it's nice to remember the small happy moments. One of my little storytime girls showed up at the library yesterday morning, dressed in pastel leotard, tights, and tiara with her hair in a neat little bun. I asked if she was going to ballet, but no, mom said she was on her way to a princess tea party! Apparently the rest of her costume was in the car. I took a second look at her, and then hastily scooped Ella Bella Ballerina and the Sleeping Beauty by James Mayhew off the shelf. "I think you'll like this." She took one look at the cover - did I mention she looks a bit like Ella Bella? and then her whole face lit up, she shyly took it out of my hands and, clutching it tightly, trotted happily off to the circulation desk. Ella Bella never fails and I love handing it to the shy little girls in pink! One of my twelve year olds has had his card blocked with fines for a while. I finally sat him down and instructed him to fill out the read off your fines form - NOW. We got his card unblocked and he went off to use the computer...then wandered back. "uh...is that Dragonbreath book on the shelf?" Score! I collected him for our teen (well, middle school) book club in early October and on the books I showed was Dragonbreath - he actually remembered the title and wanted to read it enough to ask about it almost three weeks later! This from a kid who says he "doesn't read at all". I discovered this book right before I sent my order list and hastily squished it on! I've looked at a couple other books by James Proimos, including Todd's TV, that didn't quite work for me. This one does! Very much so. When I opened it up, I just had to start reading it out loud and I can't wait to perform it with a storytime group! There's not really a logical storyline here, but who cares? We just want to read it with funny faces and make all the kids yell "Swim Swim" in unison! 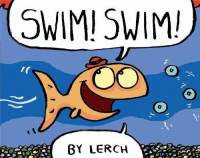 Postscript: We read this in storytime and made swimmy fish motions with our hands - up or down according to Lerch's direction. Hilarious! Delightful! Verdict: Highly recommended. Buy it for your library, read it in storytime, read it to your staff (with appropriate funny faces) and perform it for bored 5th grade classes. Snicker. This is a perfect Halloween book. Not too scary, not too silly, but the just right mixture of funny and scary! A little boy likes to watch his dad at work in his barbershop. Once a month, he's a barber too! 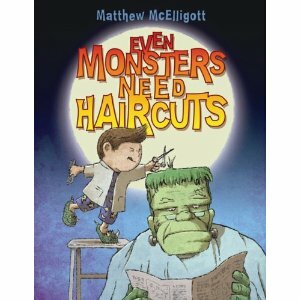 He sneaks out at night, down to the barbershop and sets up his tools....and in come the monsters, ready for haircuts! There's plenty of spooky, with a mysterious knocking at the door, gruesome monsters and lots of dark shadows. 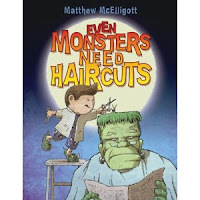 There's also plenty of funny, with an elaborate hairdo for Medusa, silly names for the little boy's equipment, and the different monsters' requirements. There's even an element of sweet, the little boy's admiration and emulation of his dad. The illustrations alternate between cameo insets of a few characters and full spread scenes, often with swirling shadows and layered colors. This is just right for storytimes around Halloween or reading aloud to preschool and kindergarten classes at any time! Verdict: Recommended for holiday collections specifically, but good for general picture book collections as well. Julia Denos is my new most favorite illustrator. When I laid eyes on this exquisite book, I immediately rearranged my order lists so I could buy it for us. It's soooooo beautiful. A little girl loves everything about Grandma, their games, the little things she says, and especially Grandma's garden. But Grandma gets older and finally she has to go the hospital. She doesn't smell like Grandma and she has forgotten her daughter and granddaughter. But she remembers to water her plants. And then she dies. Family and friends remember the special things about Grandma and tell stories - but no one seems to remember Grandma's plants, except her granddaughter. 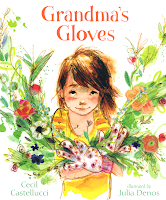 After everyone has left, she asks her mother if she can keep Grandma's gloves - and grow a garden of their own. There are so many lovely things about this book, even though I cry every time I read it. I love the portrayal of Grandma and her special relationship with the little girl. I love how Castellucci shows it's the little, everyday things people remember and appreciate. I love the warmth between the three generations, Grandma, Mama, and the little girl. I love the natural, simple way death is handled in the story. Mostly, I love Denos' illustrations. Grandma's garden blooms with life and color. Her characters laugh and enjoy life, suffer pain and loss, and heal, all vividly expressed through her artwork. Plants bloom in every landscape, mixed with shadows that express both sorrow and hope. And it's all so....beautiful. 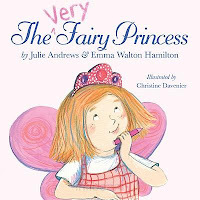 Not pretty-pretty, like many of the princess/pink stories you see today are, but truly beautiful artwork with depth and vision that's still accessible to children who like a little lovely in their lives. Verdict: A must-have. 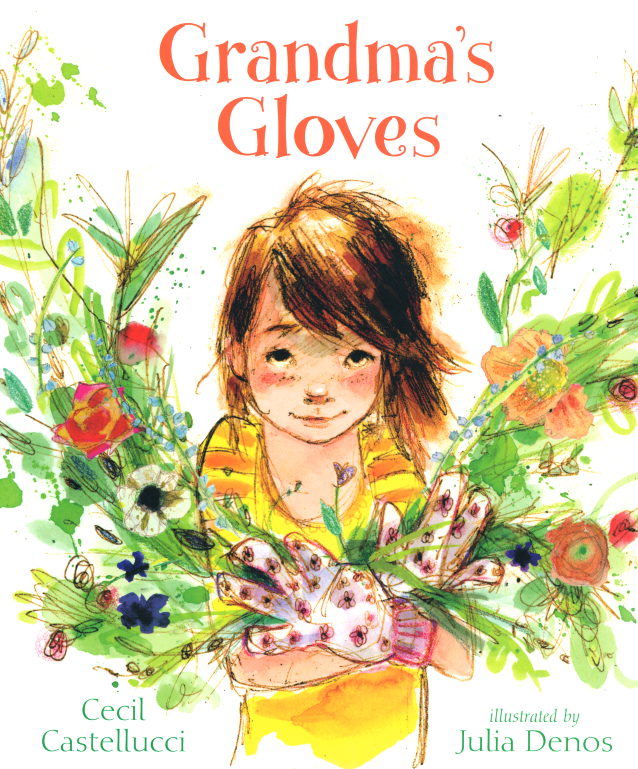 You need this one for every parent or child who has lost a beloved grandparent. You need this one to celebrate the beauty of gardens and the warmth of families. You need this one to add a little lovely to your life. 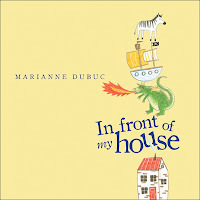 While I am not personally a fan of Julie Andrews' novels, Mandy and The Last of the Really Great Whangdoodles, they have many and varied fans and are definitely on the classic list as far as middle grade fiction is concerned. 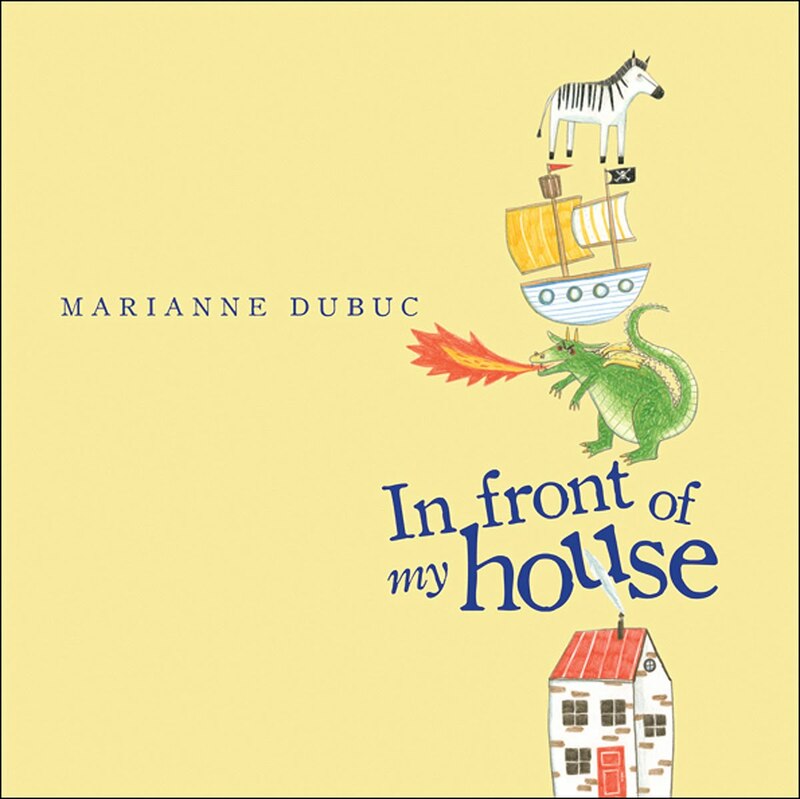 So it is with pleasurable anticipation, rather than slack-mouthed horror that I greet the discovery of a new Julie Andrews' picturebook (co-written with her daughter) - and I am not disappointed! Geraldine is a fairy princess - no matter what anyone believes. She proceeds to prove her magical qualities as she does fairy princess things, from putting on her crown and practicing her flying skills, to dancing and rescuing frogs. The story is sweet and exuberant without being sickly sentimental or didactic. Geraldine is a very human little girl, but her firm belief in her fairy powers buoys her spirits throughout what would otherwise be a very ordinary day. Christine Davenier's illustrations are strong on pink hues, with a little glitter on the cover for sparkle. But this isn't a one-color palette, like certain books I love to hate and I hardly need mention them....Geraldine's vibrant pinkness swirls through a landscape of pastels as she spreads her fairy princess spirit, shown in magical explosions of pink streamers and stars. I admit I was not a fan of Phelan's Storm in the Barn as a whole. But I've always loved his art and this collaboration with Jeanne Birdsall is pure genius. Finally, finally a really good wind story! I do at least one wind storytime in October or November and would love to do more if I could just find some better books. Pat Hutchins' The Wind Blew just doesn't work for storytime, and I've never been a fan of Hutchins anyways. Iva Dunnit and the Big Wind by Carol Purdy and Whoosh went the wind by Sally Derby are too long and the kids get restless. Sometimes they like McMillan's How the ladies stopped the wind and sometimes they don't. So basically it's just me and Ehlert's Leaf Man. Until now. Flora is mad at her little brother Crispin. He makes a mess and then SHE gets blamed! Her mom sends them both outside, despite Flora's worry that the wind will blow them away. Flora puts on her "super-special heavy-duty red boots" and knows she'll be fine. But Crispin just has regular old purple boots. 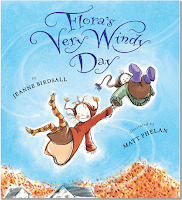 It won't be Flora's fault if he blows away...and he does! As Flora chases Crispin through the sky, she meets a series of creatures and elements that have a use for Crispin - but in the end, she decides she wants him most of all, thank you very much. 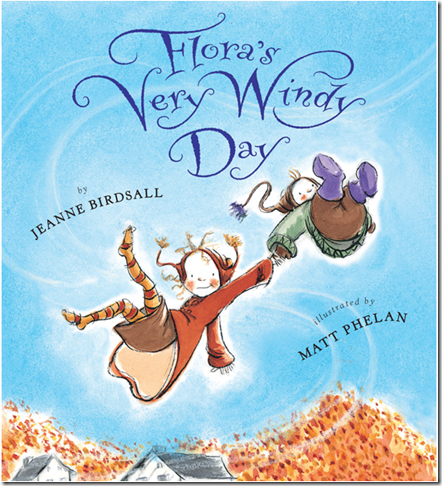 The longer text of this story is balanced by the brisk, swirling illustrations and Flora's changeable expressions, showing just how her mind works as she deals with the wind's demands. Crispin's blank bewilderment and joyful acceptance of his unexpected outing is hilarious. The lovely colors and fanciful language will hold kids' attention, even if they're not close enough to see the nuances of the art and both older and younger siblings will sympathize with Flora's frustration.